A new orodispersible film formulation VAIGLIME ® of the phosphodiesterase type 5 inhibitor, sildenafil, has been developed to examine the advantages of an orally disintegrating film formulation and provide an alternative to the current marketed products for the treatment of erectile dysfunction. The pharmacokinetics of the sildenafil 100 mg orodispersible film VAIGLIME ® was compared to that of the conventional marketed 100 mg film-coated tablet after single-dose administration to 53 healthy male volunteers (aged 18–51 years) in a randomized, open, two-way crossover bioequivalence study. The primary objective was to compare the rate (peak plasma concentration; Cmax) and extent (area under the curve [AUC] from administration to last observed concentration time; AUC0–t) of sildenafil absorption after single-dose administration of test and reference. Secondary endpoints were observed to describe the plasma pharmacokinetic profiles of sildenafil and its metabolite N-desmethyl-sildenafil relative bioavailability and safety profile after single-dose administration. The mean sildenafil and N-desmethyl-sildenafil plasma concentration–time profiles up to 24 h after single-dose administration of sildenafil 100 mg orodispersible filmVAIGLIME ® and film-coated tablet were nearly superimposable. The bioequivalence test was fully satisfied for sildenafil and N-desmethyl-sildenafil in terms of rate and extent of bioavailability. Adverse events occurred at similar rates for the two formulations and were of mild-to-moderate severity. The results suggest that the new orodispersible film formulation can be used interchangeably with the conventional film-coated formulation. 1. 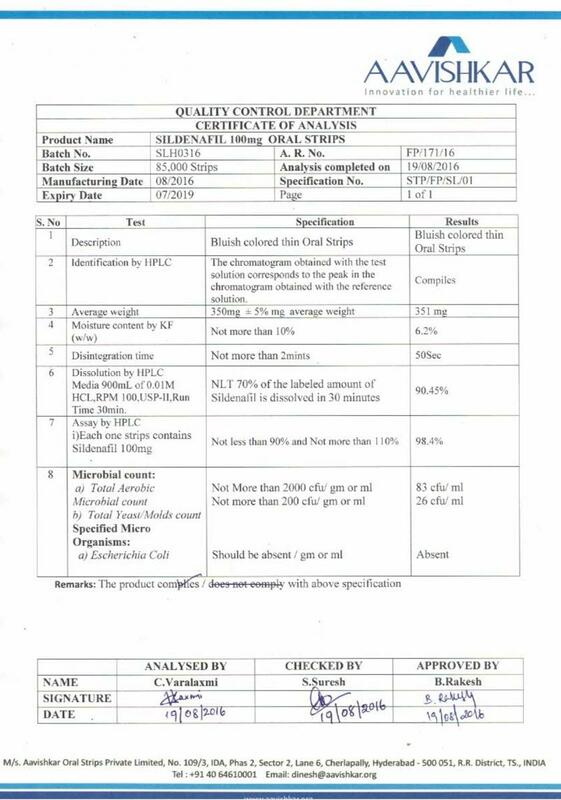 Maltodextrin, plasticizer, active ingredient, and the other excipients are solubilized/dispersed in water. 2. The mixture is coated onto a release liner and dried in the oven controlling for temperature, air circulation, and coating speed. 3. 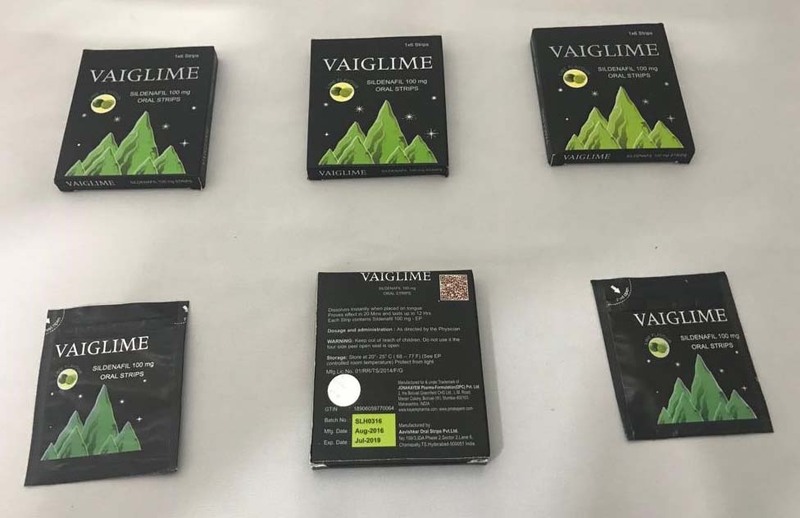 The dried mass is cut into reels and the films are then punched, pouched, and sealed in suitable single-dose sachets. The primary objective of this study was to compare the rate (Cmax) and extent (AUC0–t) of sildenafil absorption after single-dose administration of test and reference. Secondary endpoints were to describe the plasma pharmacokinetic profiles of sildenafil and its metabolite N-desmethyl-sildenafil after single-dose administration of test and reference, including Cmax, AUC from administration to the last observed concentration time (AUC0–t), AUC extrapolated to infinity (AUC0–∞), t½, time to Cmax (tmax), terminal elimination constant rate (λz), and relative bioavailability (Frel), and to evaluate the sildenafil safety profile after single-dose administration. Safety evaluations consisted of treatment-emergent AEs (TEAEs), vital signs (blood pressure and heart rate), physical examination and body weight, laboratory parameters, and electrocardiogram. Notes: Values are mean ± standard deviation, except for tmax, median (range). Point estimate, test/reference ratio of geometric means. Test = sildenafil 100 mg orodispersible film; reference = Viagra® 100 mg film-coated tablet. Abbreviations: AUC, area under the curve; Cmax, maximum serum concentration; tmax, time to maximum serum concentration; CI, confidence interval. The bioequivalence test was fully satisfied for sildenafil and N-desmethyl-sildenafil in terms of rate and extent of bioavailability (Cmax, AUC0–t, and AUC0–f). Specifically, 90% CIs of the test/reference ratio of geometric means were fully comprised within the bioequivalence acceptance range 80%–125% (Table 3, sildenafil; Table 2, N-desmethyl-sildenafil). The pharmacokinetics of the sildenafil 100 mg orodispersible film formulation VAIGLIME ® and the 100 mg film-coated tablet were shown to be without statistically significant difference. 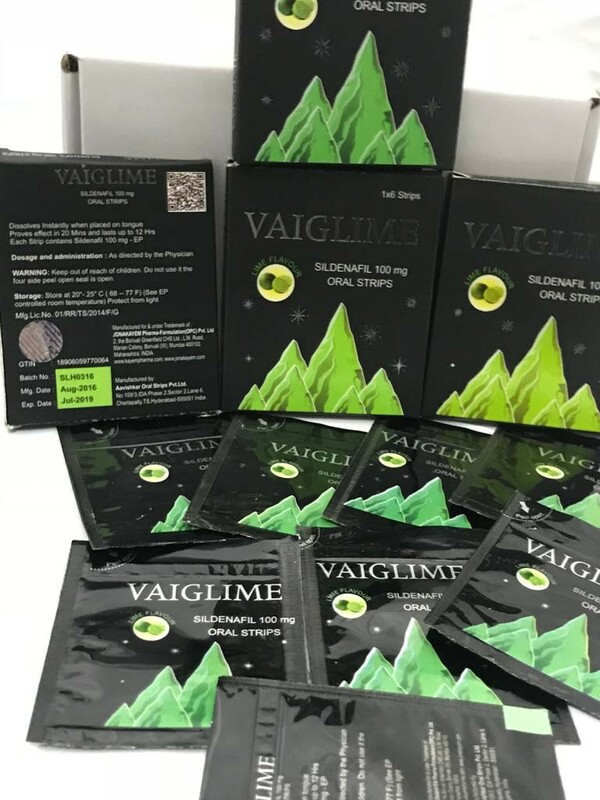 The results suggest that the new orodispersible film formulation vaiglime© could represent a valid alternative to the current marketed products for the treatment of erectile dysfunction.